Mood board: A return to dandyism was the order of the day at Junya Watanabe, tipping the scales back to formality (after seasons of denim trickery) in a collection of tuxedos and top hats filtered through his signature textile patchwork that here included silk satin, velvet, leather and corduroy. Scene setting: Watanabe rolled out the red carpet to transform the cold concrete of the Palais de Tokyo into a classy cabaret, opening the show with the shadow play of a slow-spinning disco ball. 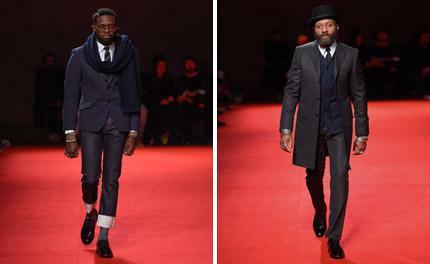 Team work: Here, casting was key - with Watanabe’s inspirations deriving from the Sapeurs (the Society of Ambiance-Makers and Elegant People) that began in colonial French Congo, he tapped a handful of genuine Parisian dandies to represent.